Hummingbird Resources has been very busy since last speaking to RGN in February 2016. The AIM-listed firm has made substantial steps in advancing the low cost, high grade Yanfolila gold project in Mali. The mine is expected to be pouring the first gold by the end of 2017, a new team for construction and production has been put in place, the project is fully funded thanks to some strategic raises in the last year from different sources and the construction process is firmly underway. Hummingbird CEO Daniel Betts says the project is delivering as per the plan and expects the mine to be completed on time and on budget. Hummingbird delivered a definitive feasibility study on Yanfolila in January 2016, followed up by the optimised new mine schedule, which outlined a mining plan of 132,000 ounces gold production in the first year and life of mine production at 107,000oz p/a. The AISC remains low at US$695/oz and the after-tax IRR sits at 60% at a US$1,250 gold price. 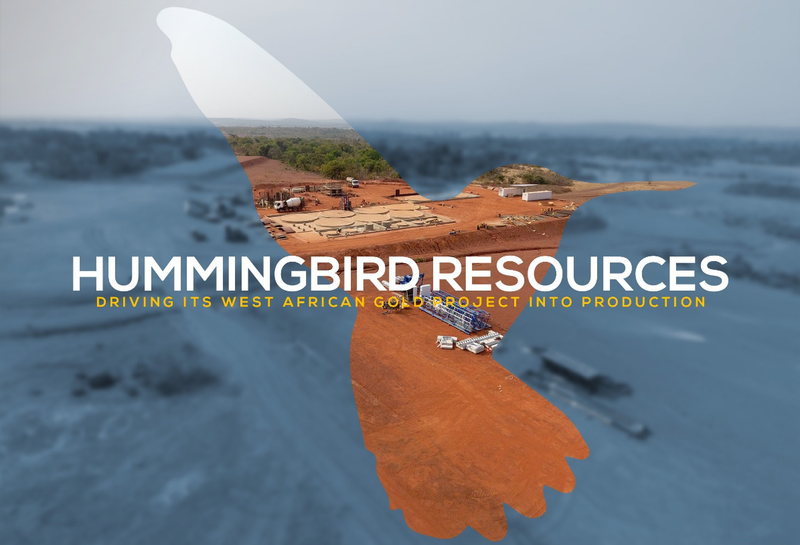 Over the last year Hummingbird has been able to secure ample finance to fully fund Yanfolila and that has been a major achievement in terms of commencing construction in Mali. In June 2016, Hummingbird announced a $71 million equity raise from markets in London and the US which serves as a reflection of the potential of the project and the confidence in the team. On the back of that the company reengaged with its lender Taurus Funds Management to restructure the loan deal, reducing the total loan amount and in February of this year the Government of Mali paid $11 million to increase its stake in the project to 20%. “[The raise] was a catalyst, it recapitalised Hummingbird and allowed us to commit to construction at Yanfolila,” explains Betts. “We are fully funded and that is a major step forward from where we were last year. It means we are building the gold mine and also on all sorts of operational levels the progress has been monumental. With the financing in place the next key step was for Betts to form the right team to take the project through the crucial construction stage and into production. Hummingbird has implemented a structure of divisional VPs responsible specific sections of the project overseen by senior VP for project delivery Shaun Bunn. The vastly experienced Wayne Galea is in charge of managing the engineering, procurement & construction management contract, former British Army officer William Cook is taking on operations management, David Hebditch is on board to run the safety, health, environment and community considerations and Murray Paterson is the chief geologist. Betts highlights that in addition to all the planning for the mining operations, when the site is fully manned in around August there will be almost 800 workers. “We have to think about every flushing toilet, every meal and every knife and fork so we will effectively be running a huge catering business as well as a mine. That will all fall on Will’s [Cook] plate for getting the logistics right,” remarks Betts. Betts is confident the team will be able to deliver the construction of Yanfolila on time and on budget, however then it has to be passed on to an operating team which requires a whole new set of skills. Hummingbird has announced that Kevin Moxham, a professional engineer with over 30 years’ experience in managing African mining projects, will take over from Bunn when the project hits production. Moxham has a glittering track record of delivering excellent results on a number of major African projects. Moxham was most recently general manager and head of operations at Newmont Golden Ridge, overseeing the commissioning and construction of the 9 million tonnes per annum (mtpa) Akyem gold mine in Ghana. He also managed the delivery of the Eritrean Bisha mine for Nevsun and acted as head of global engineering for Goldfields. Betts is in no doubt as to how important he will be for the project. Hummingbird has the key personnel in position to drive forward with the construction, which Betts says is going as well as he could hope for. The concrete foundations have been poured – an area which can cause major delays if hampered by wet weather – the carbon in leach (CIL) tanks are being erected and all of the engineering drawings have been completed by EPCM contractor SENET. “Here we are seven months into the build and we are going well. We are on schedule and on budget. However nothing of this scale is going to go absolutely seamlessly and everyday there seems to be a challenge, but all of those challenges have been anticipated and I would say that is key,” observes Betts. For a junior of Hummingbird’s size taking on the full mining operation would be a monumental task. Instead the company is employing a contractor model using key supplementary companies to perform each duty. All of the major contracts have been signed on the basis of a proven ability to operate in Africa and an exemplary safety record. IMAGRI-SARL has been awarded the structural, mechanical, plate work and piping (SMPP) contract and has begun delivering steel work, SENET is overseeing the project as the EPCM contractor and African Mining Services (AMS), a subsidiary of Ausdrill, will take on the contract mining responsibilities post-production – a contract worth $250 million over the life of mine. We are in the process of appointing a well-known world-class power provider as well. “In every single contract we have issued there has been a full tender process reviewed by us and independent contractors, we certainly haven’t just gone for the cheapest,” Betts also explains how big a task it would be to bring the mining operation in house. “As a new company that has never built a mine, the art of mining and running a fleet is a whole new science for us. “If we were learning that while we were also building the mine and the plant and managing everything else we could drown. “I think it’s the right strategy for us to outsource to a professional contract miner but the management of the contract and the interface with us is absolutely vital because it’s the biggest contract we will ever sign. Betts is going to use the partnership with AMS to develop a residual knowledge of the mining operation so if the opportunity arises to bring that element in house on another asset and if it will save the shareholders money, Hummingbird will have that option. However, with contract mining comes a significantly reduced capital expenditure. It is likely that the mining fleet will total around $100 million, almost doubling the project’s capex spend, that figure has to be traded off against an ASIC saving of around $100/oz. While the foundations are in place for construction at Yanfolila there is still a huge amount of work to get through before reaching Betts’ target of first gold production by December 2017. The concrete has been poured for the plant, the mill and the gold room and the terraces for the power have been installed. The next steps involve completing all the steel and piping work, bringing the reagents on site, electrifying the plant and then move into commissioning. “We have to run it to make sure it all works and iron out any teething problems. There is still a huge amount of work to do. It is hugely complicated but we are not reinventing the wheel here, it’s a pretty standard gold plant,” says Betts. Outside of the plant the major focus is preparing the camp so it is capable of housing and feeding the 800-strong workforce expected later this year. Following that the mining fleet will need to be mobilised to pre-strip the pits before the plant is commissioned. Then finally Hummingbird will construct the tailings dam. The gold price and how it performs in the next few years will be a key determinate of Hummingbird’s fortunes. Having based the numbers on a gold price of US$1,250 Betts says any fluctuation of $10 on the price will result in $1.3 million either onto or off the bottom line. He adds that its a unique industry where the biggest variable in terms of revenue and profit is something which is completely out of the company’s control. There is the option for Hummingbird to hedge a small proportion of the production to paying back the debt facility, of $40-45 million – protecting the company from any sharp moves in the gold price. With $60 million free cash potential at US$1250 and four years to pay back the debt it would amount to only a small portion of production that would require hedging. Betts says ideologically he is against the idea but he recognises the that prudently there is a place for it and the board will discuss the option in the coming months. “I think the market is pricing in a lot more risk than remains. The market has been so bad for so long and I don’t think people think anything is ever going to happen in mining in West Africa.